Date posted: October 28, 2015 by: JasonDarkX2 Category: Gaming Reviews 5 comments. 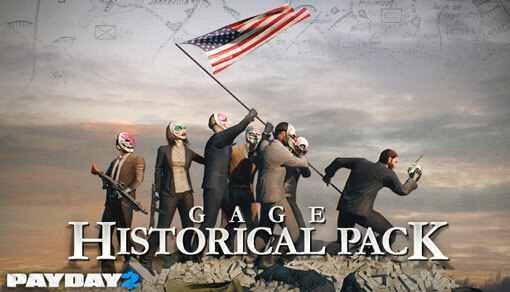 Ah yes, nothing like a Gage weapon pack DLC to get to come back to robbing banks shooting enforcement in everyone’s favorite heist simulator, Payday 2. Folks over at Overkill software releases Gage Historical pack on November 13, 2014 for $5.49cdn. Which at first glance makes one be like five bucks for a set of old guns and melee weapons this must be a joke. But it wasn’t long before it went on sale. Having picked up for a buck $1.75cdn way back, enjoying it too much to post this review at that time. But now in 2015 it goes as low $0.82cdn sale price, it was the second best weapon pack after my long time personal favourite after gage weapon pack #1. But is it still worth it now? Having been a long time heavy eagle user prior update #79 back in Payday 2 happy land. The Nagant bolt action rifle, one of the two primaries in historical pack offers the best reason to dump the heavy eagle if you’re some who’s looking for a high damage output weapon while offering range without sacrificing rate of fire. Not only is the Nagant second best looking weapon when fully upgraded with a bayonet attached. 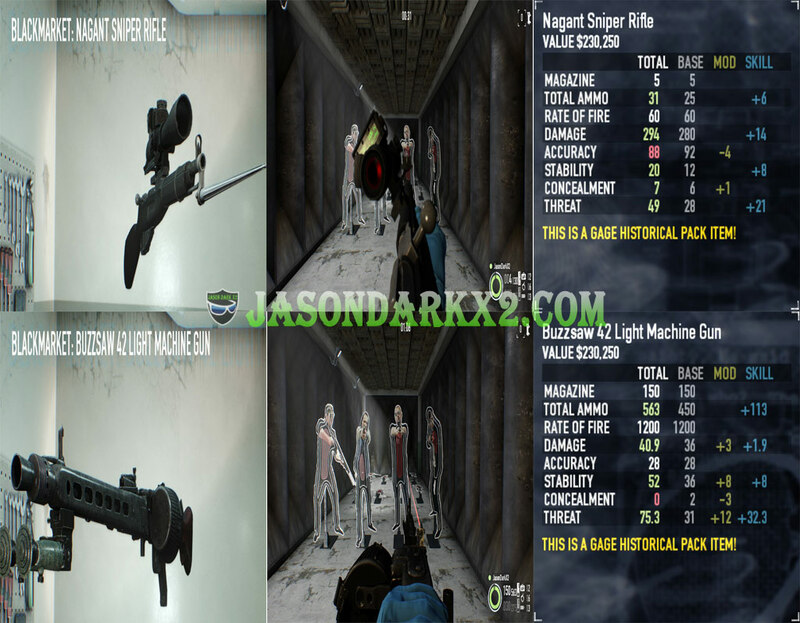 It makes up what lacks with what the sniper pack offered, which was a middle class rifle that was high powered rifle with a good fire rate that doesn’t put you at risk when having to get up close and personal with the iron sight attachment. The added armor and shield penetration makes it swiftly taking down armoured units and the Dozers on Overkill. With its ease of use, damage, range and its unobstructed iron sight make it the best go weapon for almost any loud situations. In terms of secondary and melee weapons which I personally found the five melee weapons to be largely forgettable and uses end once their achievements are obtained since there is no shortage of the already added melee weapons added through community events or other weapon DLCs . 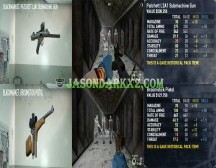 Most notable one is the trench knife which you’ll be using for 25 stealth kill achievement with, has a high concealment. Making it a perfect choice for stealth builds. Unless stabbing people with a flag pole is your think then the Spear of Freedom is your best friend. Otherwise a fully upgraded broomstick pistol,which in my opinions looks like a space pistol, but packs quite a punch for an old classic. 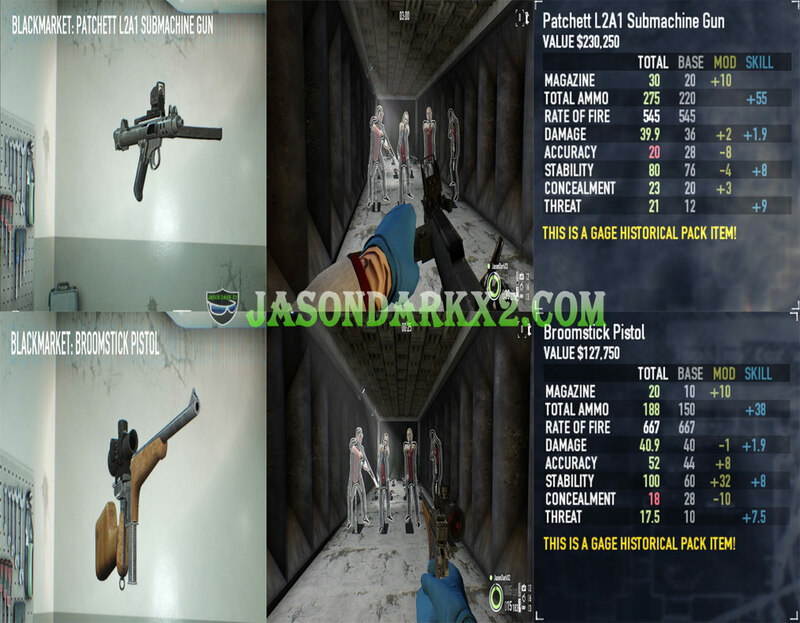 While the Patchett L2A1 sub machine is the new king of damage of its class for those interested in high damage sub-machine gun at the cost of being expensive(in game cash),low ammo and high recoil. The overall weapon selection of historical pack consists of a great selection of classic weapons to choose from. Meanwhile, in the masks and mask customization bundled in this pack is a sort of a like or hate position. If you like faces, Historical pack has 4 of them which are unlocked by achievement, making customizable options returnable to stash and not obtainable in card drops. In my opinions masks keep stock looks the best in my opinions. Materials Army Green, red sun, and captain war pattern are the only good options from this pack. Overall the historical pack for its time before the black market update (PC) was the go to pack if you want a versatile rifle that was good for long and short range scenarios without the loss of fire rate and ability to penetrate shields, the Nagant rifle made the Historical pack a worth wild purchase for anyone dawning a mastermind/tech loud build. But now with the rebalancing update making pistols and akimbo pistols the go to weapon of choice.Weapons packs like the historical pack no longer seem as powerful weapons like before. Though I’ll only recommend it if you’re looking for classic weapons set or rifle to take along for loud missions, Otherwise You’re better off getting the Gage sniper pack or Gage weapon pack 2 first to get the most in terms or sniper rifles or LMGs.